The double top is a major reversal stock pattern that forms after an extended uptrend. The stock trading pattern is made up of two consecutive peaks that are roughly equal, with a trough in-between. Double-top patterns marks at least an intermediate change, if not long-term change, in trend from bullish to bearish. Until key support is broken, a reversal cannot be confirmed. Prior Trend: With any reversal pattern, there must be an existing trend to reverse. In the case of the double-top, a significant uptrend should be in place. First Peak: The first peak should mark the highest point of the current trend. The first peak is fairly normal and the uptrend is not in question at this time. Trough: After the first peak, a decline takes place that typically ranges from 10 to 20%. Volume on the decline from the first peak is usually not important. Second Peak: The advance off the lows usually occurs with low volume and meets resistance from the previous high. Even after meeting resistance, only the possibility of a double top exists. The pattern still needs to be confirmed. The time period between peaks can vary from a few weeks to many months, with the norm being 1-3 months. While exact peaks are preferable, there is some leeway. Usually a peak within 3% of the previous high is adequate. Decline from Peak: The subsequent decline from the second peak should have an expansion in volume and/or an accelerated descent, perhaps marked with a gap or two. This decline shows that the forces of demand are weaker than supply and a test of support is coming. 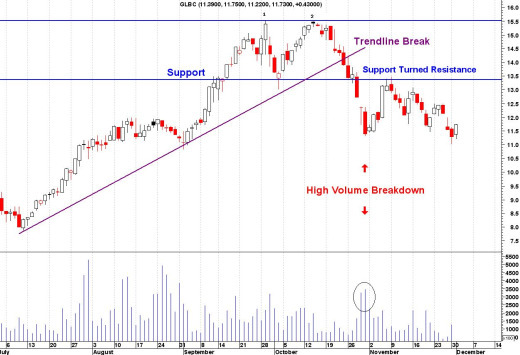 Support Break: Even after trading down to support, the double top and trend reversal are still not complete. Breaking support from the lowest point between the peaks completes the double top. This too should occur with a large increase in volume. Support Turned Resistance: Broken support becomes potential resistance and there is sometimes a test of this newfound resistance level with a reaction rally. Such a test can offer a second chance to exit a position or initiate a short sale. Price Target: The distance from support break to peak can be subtracted from the support break for a price target. This would mean that the bigger the formation is, the larger the potential decline. Perhaps the most important aspect of a double-top is to avoid jumping the gun. Wait for support to be broken in a convincing manner, and usually with an expansion of volume. The trend is in force until proven otherwise. Until support is broken in a convincing manner with large volume, the trend remains up. Return from "Double-Top" to the Home Page: "Stock Market For Beginners"